Leinster and Ireland back row Jordi Murphy looks set to join Ulster at the end of the season. An Ulster Rugby spokesperson confirmed to the BBC that "discussions have taken place" with regard to the move. Murphy, 26, recently returned to action after 10 months out with an anterior cruciate ligament injury and earned his 18th cap against Fiji last month. Murphy's former Leinster team-mate, prop Marty Moore, has already confirmed that he will join Ulster from Wasps. Ulster have used five academy forwards this season and have identified the pack as an area to strengthen. The IRFU policy of restricting foreign players means Ulster have to look at Irish qualified talent. Current Ulster head coach Jono Gibbes coached Murphy for three seasons at Leinster, while the flanker also worked with Les Kiss when he was Ireland's defensive coach. Murphy has represented Ireland at Under-18, Under-19, Under-20 and senior level - his debut coming in the Six Nations against England in 2014. 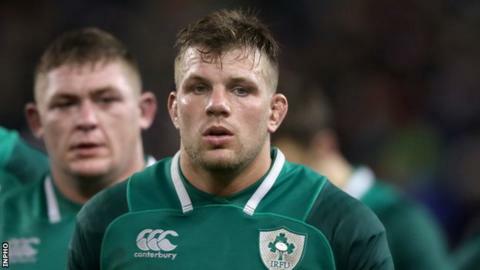 He scored the opening try in Ireland's landmark victory over New Zealand in Chicago in November 2016, but suffered an anterior cruciate ligament injury. Murphy missed the initial 28-man call-up for November internationals, but was called in after injuries ruled out Dan Leavy and Tommy O'Donnell.